Visits to school nurses have significantly increased, likely because of the difficult economy. 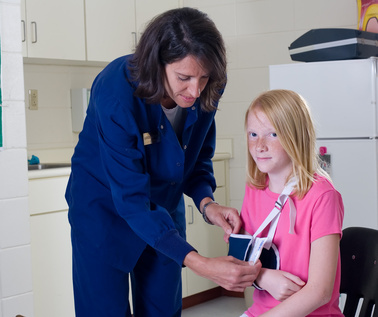 People often lose health care when they lose their jobs, meaning that they will sometimes send their kids to the school nurse before their primary care doctor. In Rhode Island, increases in the last five years total in the thousands, according to this article on in the Valley Breeze. Linda Newbury, a school nurse, provided figures that indicated that visits doubled at one school (3,800 visits to 7,554 visits) and increased significantly at almost all schools. Only one school had a decrease, from 11,000 to 10,930. School nurses also are expected to address a much wider range of medical issues, from standard sore throats and fevers to allergies and diabetes. Cumberland school nurse Margaret Wharton said while the district had not compiled specific figures, she has also noted a similar increase in visits as the neighboring town. “All I can say is that student visits to the nursing offices appear to continue to increase each year as many families have lost health coverage due to economic issues,” she told The Breeze. Wharton said she is “very concerned” for the next school year, when there will be one fewer nurse in the schools due to budget cuts. The illnesses seen are cyclical, Villeneuve reported at the meeting. While strep was prevalent several years ago, this year saw more cases of pneumonia, she said. The nurses all spoke about the increase in number and types of food-related allergies. Wharton said when she started in the schools 21 years ago, she had about five EpiPens for children with allergies. Now she said she has “a wall full” with about 35. Newbury said more “medically fragile” students are enrolled in school with more cases of autoimmune diseases and diabetes in children as young as 3.